I wish they had more things like these all throughout winter. Something different to the many outdoors food truck-ey / picnic-style events : something a little more chic – where you will make an effort to dress up, have a cup of tea, or maybe a gin & tonic, or go all the way to a glass of Laurent-Perrier champagne. 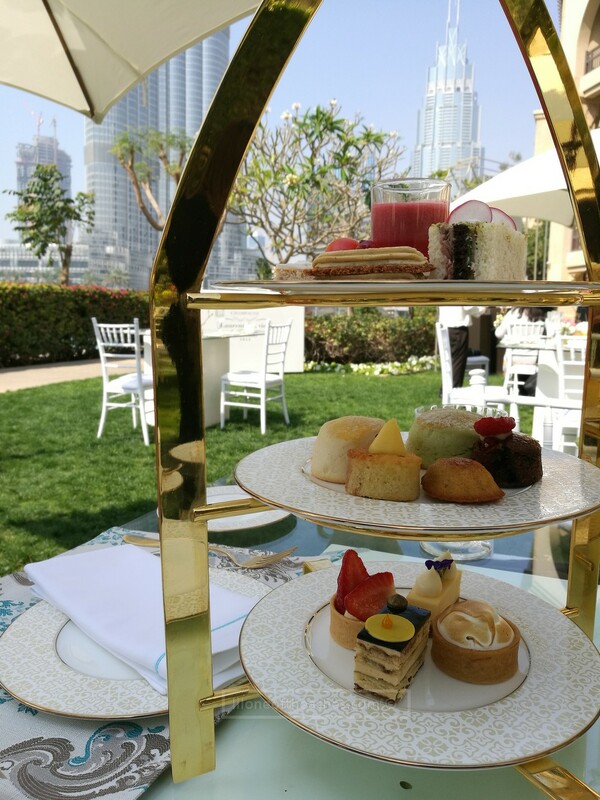 Put that together with a gold tier of scones, finger sandwiches and sweets, a harpist on the side, Burj Khalifa in front and if you choose the right timing, the fountains as well : you have yourself the Bvlgari Afternoon Tea at the Lakeside Garden in The Palace Downtown Dubai. So mum and I and the little munchkin headed towards The Palace this afternoon as part of an invitation to review the newly launched afternoon tea, happening just this month in March. 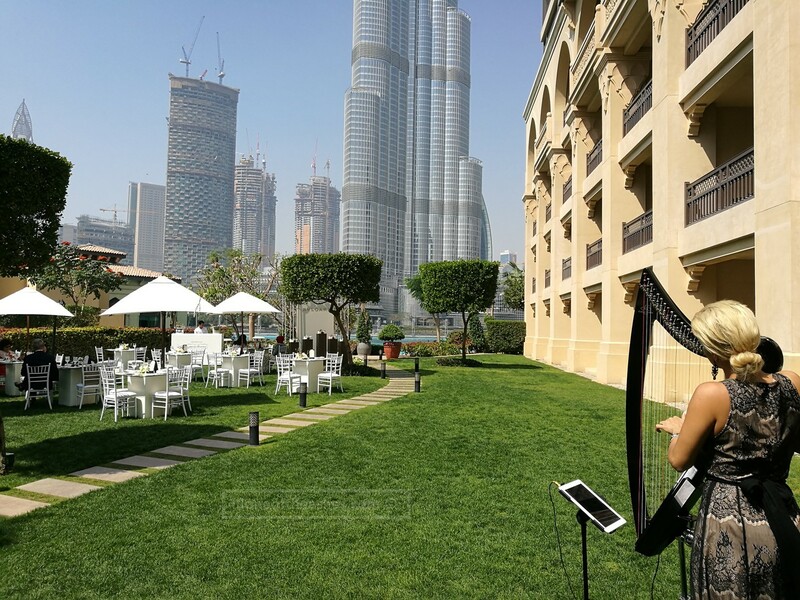 I had thought that it will be in Al Bayt itself (which we have been numerous times, one of our favourite afternoon tea spots) – and was surprised to be lead downstairs to the grass area next to the pools. A picturesque setting with white chairs and tables, fresh flowers on each, it felt like we were attending a cosy wedding gathering of sorts. So pretty – loved it. Thoughts of the afternoon tea spread itself? Put on your best afternoon tea dress, gather the girls (or your date) and make an entire afternoon out of it. Splurge a little if you wish and you could have free-flow Laurent-Perrier champagne for the afternoon, and there will be someone from Bvlgari showing you the different Bvlgari perfumes on display that afternoon. PS : From what I understand, some of the food presented today did not match the menu itself : hopefully when you go they would have everything ready, and that it will be better than what we had today. Let me know! AED 550 per person inclusive of unlimited premium bubbly. Deal : Give me some time, I’ll find out if you can use the Entertainer for these. Watch this space! 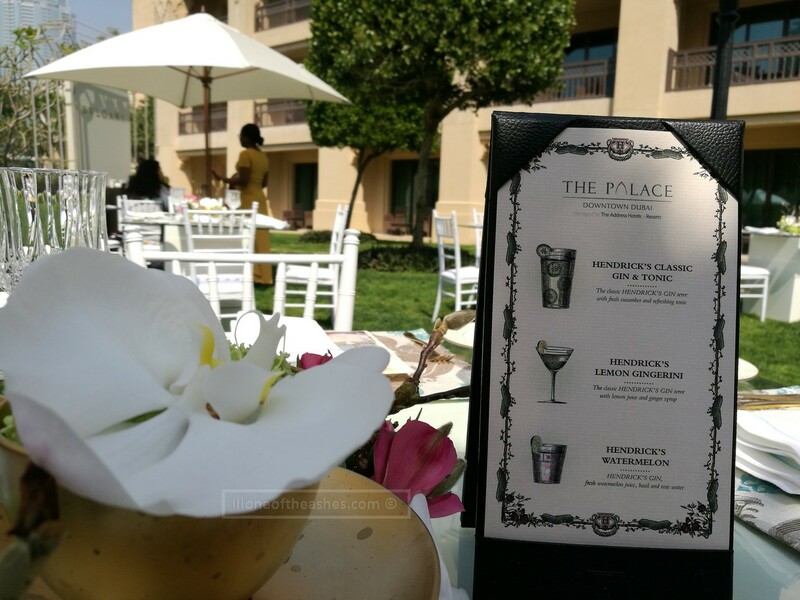 Disclaimer : We were guests of The Palace Downtown Dubai to review the Bvlgari afternoon tea. Thoughts are our own, though it is entirely up to you to judge. This totally sounds like a “me” thing to do! Thanks for the heads up. I will have to get booking!! You know it will be! I am a bit partial to bubbles! I am just waiting for the girls to respond to the email. The Entertainer information will totally help! If not, The Boy is going to have to come and play tea parties. Where can I guy a tiara for a 6ft5 tattoo’d princess?!?!? Did you just say you’re 6 5 ? Omg. You’re tall !!! Haha. Have fun, let me know how it goes if you go. Haha! No… The Boy is 6ft5. I am still tall but only 6ft!! !